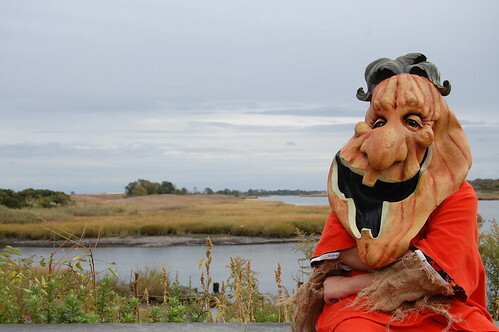 This years Halloween walk was a mixed bag of fun and some disappointment. Disappointing only because the threat of rain forced the walk inside the nature center, and not on a trail like it was in previous years. Fortunately enough…all of the volunteers stepped up and played the hand they were dealt offering the community a great event. Once inside the nature center Marine Park Civic was offering free group pictures that they would print for you on the spot. Local politicians State Senator Marty Golden and Councilman Lew Fidler were handing out apples and candy. 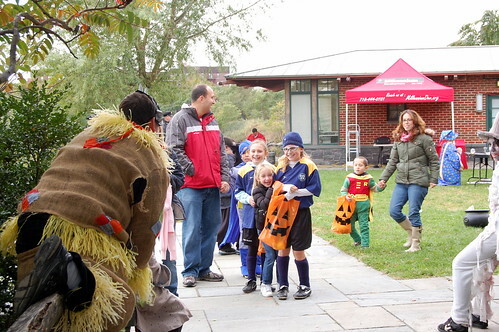 After getting candy and apples for the kids, family’s walked into the nature center yard where characters were, then out the path to the street with more characters along the way. Halloween this year was fun for all of the trick or treater in the neighborhood. There were many small to large groups of family and friends who made their way from door to door filling their bags with candy. I spent most of my time in the â€œNew Sectionâ€ due in part to my love for sidewalks and also there are more groups in the area. 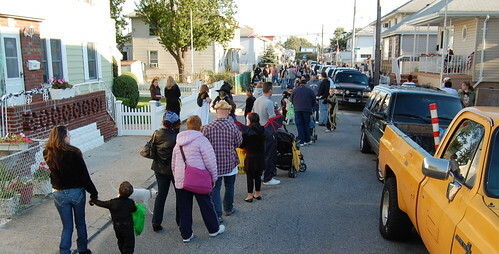 Gerritsen Beach once again lived up to it’s reputation as one of the worst Halloween Mischief neighborhoods in Brooklyn. Although there was a stronger police presence this year than in years past, it was not strong enough to prevent dozens of teens from vandalizing the avenue with eggs and shaving cream. PS 277 had a pumpkin and cupcake sale, that I headed over to after the concord. Seemed like loads of fun, most of the grades came out. Its very funny to see the kids try to eat cupcakes while running around trying to get a pumpkin. 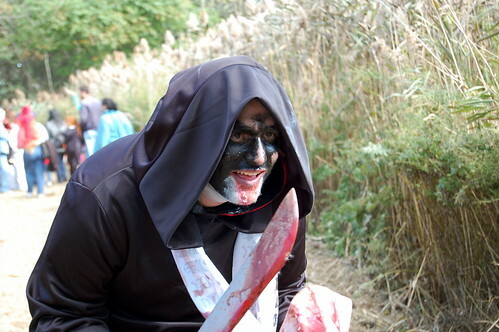 Creatures of the night make a daylight appearance for this frightfully fun walk through the park, which is followed by a delightful puppet show for all ages. 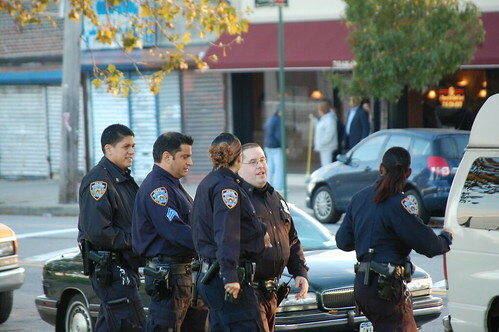 Update: Hello to the officers of the 61st Precinct who read this! I attended the 61st Precinct Community Council meeting tonight. It was so much fun! Don’t get me wrong, I hate these meetings. They are long and boring, but this is how things get done and someone has to go. The precinct didnâ€™t have too much news to report. 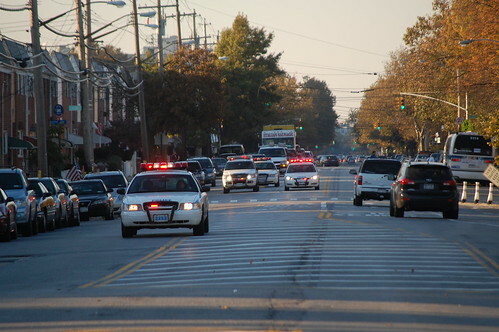 Captain Vincent G. Stella and his team have kept crime down for the most part; impressively, there was not one assault or stolen car for an entire week. However, purse snatching seems to be the trend during the before-and-after work rush. Women should be careful walking down side streets near busy train and/or bus stops. After reading all of the responses on this site to the Halloween fiasco, I was expecting to see members of our community at the meeting to discuss/complain/demand answers about the police presence on Halloween. Everyone seemed so concerned about the kids in the neighborhood throwing eggs at the cops, damaging the bus shelters and being rowdy. People were complaining on this website that the cops didnâ€™t do anything to disperse the huge crowd of teenagers or arrest anyone for vandalism. Isnâ€™t anyone curious as to why the police responded the way that they did on Halloween? If we were a more vocal community maybe we would get some answers. Halloween this year was fun for all of the trick-or-treaters. 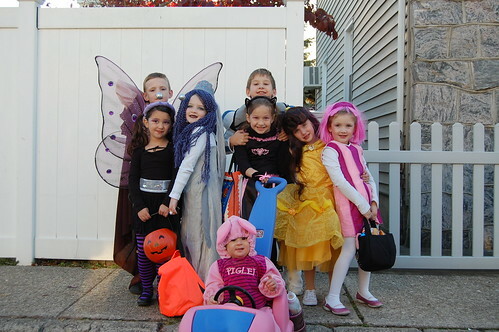 Small to large groups of family and friends made their way from house to house filling their buckets and bags with candy. I spent most of my time in the “New Section” because I like sidewalks and they are family friendly. 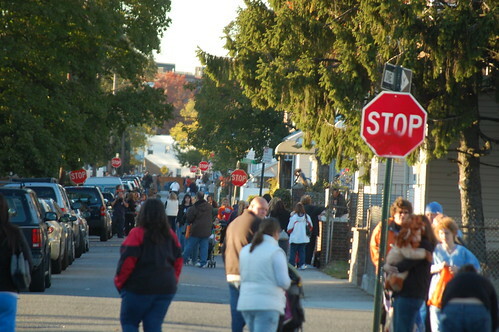 Gerritsen Avenue was all but fun for bus drivers, city vehicles, car service, and delivery drivers on Halloween. The mischief started late afternoon and ended early evening. A large crowd of teens pelted vehicles with eggs. It was like a firing range; buses were hit on both sides as they drove by.